Submitted by Fuseblower on October 31, 2011 - 2:48am. We, hoods get my vote. Umbrellas are anti-social, and I can't stand water dripping down the back of my neck! And that's a good colour for a coat! Submitted by Kisai on October 31, 2011 - 8:43am. Umbrellas in Vancouver are free ;) on any rainy+windy day you can usually find a dozen abandoned ones. 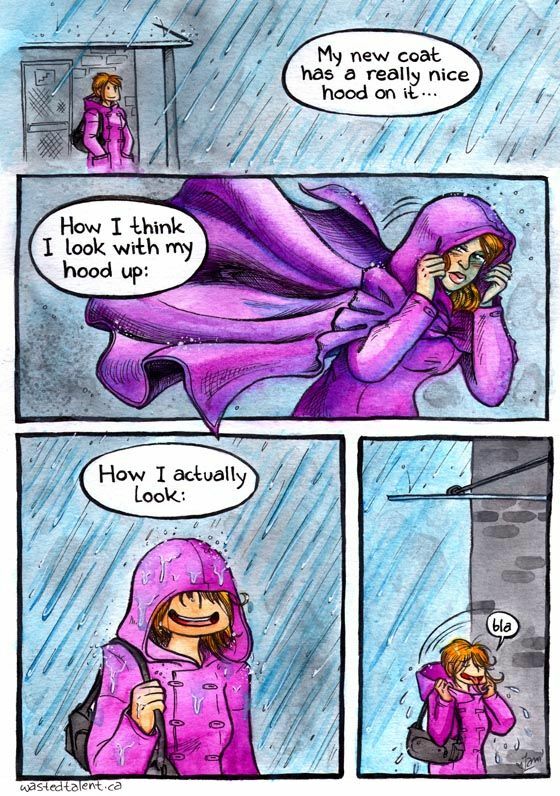 Me personally I use the hood on my coat unless it's a torrential downpour. Submitted by George Watson on October 31, 2011 - 6:07am. Submitted by Nira on October 31, 2011 - 7:36am. You have encouraged me to make myself a real cloak. Note to self: waterproof the outside layer. Submitted by Rashkavar on October 31, 2011 - 12:32pm. I think cloaks were waterproofed with beeswax in their day. Not sure if you want to go completely medieval or rely on something a little more technological for your waterproofing. That said, waxes in general are pretty darn hydrophobic - it's probably the best you can do without industrial chemicals. Submitted by John Edward Casteele on October 31, 2011 - 10:06pm. Submitted by elsbethrenee on November 1, 2011 - 12:41am. Wool also has some fairly good water-repellant properties because of the sheeps' natural oils. If you're looking for something to wear in a real storm, though, I would suggest augmenting that with a canvas layer, beeswax, etc. Submitted by Ayshela on November 1, 2011 - 10:16pm. Submitted by Rashkavar on November 3, 2011 - 1:05am. Diapers may have to handle messier flows, but there really isn't all that much coming through. A November storm on the West coast, on the other hand - that's a lot of water. Submitted by Ayshela on November 3, 2011 - 10:30pm. Submitted by Nira on November 1, 2011 - 5:54am. Submitted by Steeltoe on November 1, 2011 - 2:32am. Are you this adorkable in real life? Gives me hope for finding a nice geeky girl. Submitted by dustbucketau on November 1, 2011 - 6:02am. Submitted by omniwarrior on November 4, 2011 - 4:53pm. Hmm... How about we see some real pictures of you and this coat so we, your audience, can make that determination. Personally, I have never much liked off the rack clothing. I always have to make some alterations. And, No, sewing is not just for girls. Although I do have to admit that my wife is better at it than I am. Submitted by Givenup on November 8, 2011 - 3:56pm. I can't believe no-one made A Dungeons and Dragons cartoon comment. Submitted by Sparrowsabre7 on December 27, 2011 - 5:33pm.